When you hear Tyler Grant’s name, you are most likely to conjure memories of the Emmitt-Nershi Band, or even more likely the acoustic guitar he flatpicked on his way to numerous awards and distinctions. He is synonymous with Nashville, and the country sound that the city holds so close to heart, but more recently he is guitar player extraordinaire along the Colorado front range, plugging in his telecaster and ripping through originals and covers with his band Grant Farm. 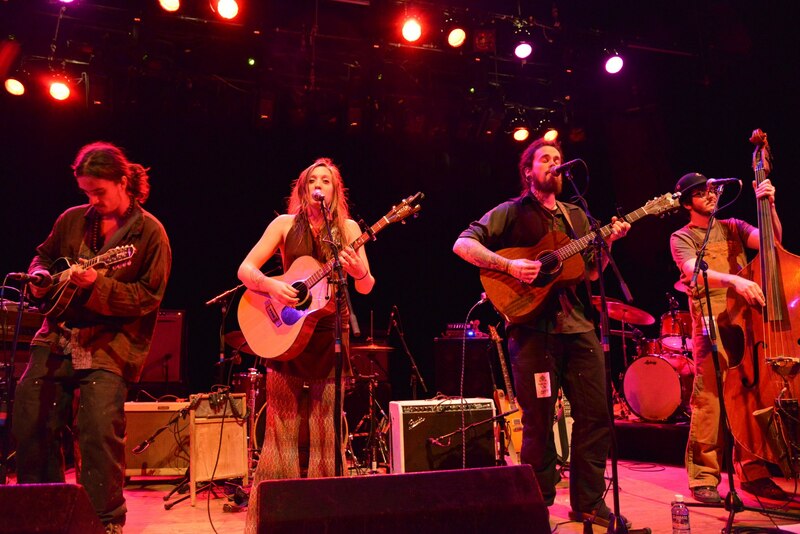 Through a blend of good old rock and roll, country, reggae, bluegrass and traditional music, this band is not your normal jam band and they aren’t just any Colorado pickers. The Colorado jam band scene is filled with a variety of bluegrass inspired acts, as well as some in the vein of jamtronica, but Grant Farm has taken things to another level with their self-described country-disco. At the heart of their range is Grant’s guitar, which is its own breed but can be thought of in a Derek Trucks, Stevie Ray Vaughan, or Eric Clapton covering JJ Cale style. There’s a country flare and a soulful melody each time he touches the strings, and it wills the band to new heights during their live shows. 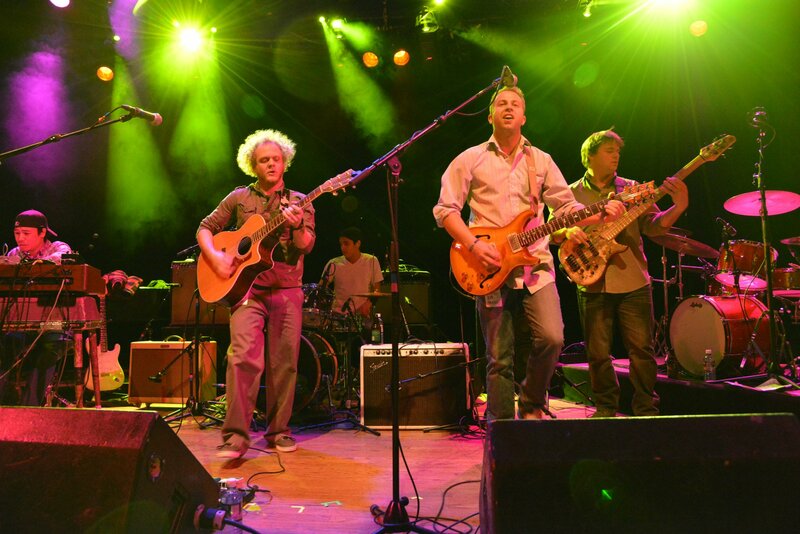 Lending a helping hand to Grant Farm at the Boulder Theater was String Cheese Bass player Keith Moseley, who originally played with Grant before former Hot Soup bassist Adrian Engfer joined full time. Keith played on a number of songs during the show, with the two bass players swapping out acoustic guitars when one or the other had a knack for a certain song. 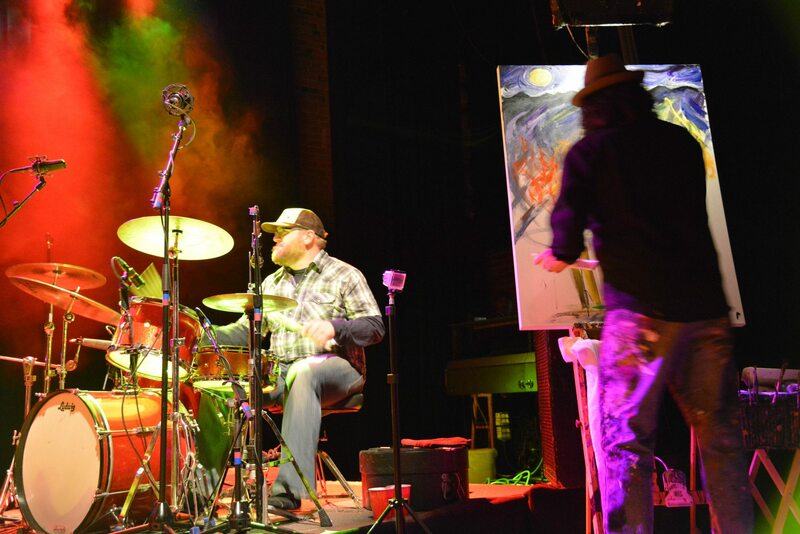 In addition, Gipsy Moon and Frog’s Gone Fishing were on hand to open up the evening, and legendary Colorado artist Scramble Campbell was set up on stage all night slapping paint to canvas as the bands burned through their sets. Gipsy Moon is a soothing collective of Boulder County multitalented artists playing traditional, folksy bluegrass inspired by the beautiful world around them. With an upright bass, acoustic guitar, mandolin and banjo as their primary instruments, this quartet bobs along in musical syncopation while harmonizing together as they swap leads on vocals and solos. In appearance this band truly looks like a traveling band of gypsies making their way with music as their guide. The lovely Mackenzie Page, an artist in every medium she graces, strikes the crowd with an antebellum strum of her acoustic guitar and pulls in the crowd with her raspy coo. She can even play washboard, while her cohorts in Silas Herman, David Matters and Colin Huff completely own their instruments and swap solos within a single song seamlessly and lacking ego. Frogs Gone Fishin’ is a culmination of many things, and sound like a funk band on the surface. I like to think of it as electrified Front Range frog funk. With elements of New Orleans jazz and funk, its no surprise to hear them cover “Cissy Strut” by influential and groundbreaking artist, The Meters. I’m in over my head when they drop into a reggae bass line typical of jam bands like this who overreach throughout their material, but they are fine players who really excel together and pull it off besides trying to implement a crowd hand clap that falls flat. New drummer Jeff Janni supplies a very technical style that’s cool to hear with this sort of band and adds a certain break beat feel to most of their songs. After clearing the stage, Grant Farm rolls on and bursts right into their set. Tyler’s work on “Times have Changed” recall Allman Brothers’ riffs and leads that sear like a stove top set on high to the beat of Chris Misner. It’s immediately obvious how talented he is, and while he has put in the work and paid his dues, he is a natural, and it is no wonder he struck out on his own to pursue his music and pick up the electric guitar. His hard, southern inspired sound shoots through the theater while the band is churning, and really getting at it. All the while Scramble Cambell bangs the canvas like an additional drummer. Covering material from other bands seemed to be something Grant has been accustomed to, and he knows how to make them sound like his own, something the Grateful Dead were notorious for. Perhaps feeling the love from Bob Marley’s birthday a couple of nights prior, they laid down a funky “Soul Rebel,” dedicated to Chris, Sarah and Team Mosely. Another choice cover for Grant’s familiarity with the genre was the delta blues staple “Sitting on Top of the World.” And my personal favorite, towards the end of the show, was “Maggie’s Farm.” A popular song by Bob Dylan, the Grateful Dead made this a staple of their live performances and it seemed Grant Farm chose to play it in the manner with which they did. After seeing the caliber of show that Grant Farm can bring to the table, it’s easy to understand why they are looking for a spot at Eric Clapton’s Crossroads Festival. Grant is such a talented guitarist that he is looking to make his name known, and for good reason. After lending a hand to bands and becoming a master of flatpicking, isn’t it only natural to keep moving forward?